Television is the most influential advertising medium and it has been proven that ANY BUSINESS can benefit from using it to reach potential customers. Whether your enterprise is retail, service, manufacturing, business-to-business, or distribution based, NBC U.S. Virgin Islands can help you research, refine, reach, persuade, and GROW your sphere of influence. 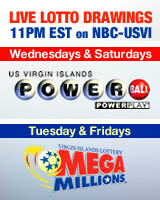 NBC U.S. Virgin Islands offers complete production services. Our Production Department will work with you to understand your needs, goals and target customer, then apply expertise and imagination to producing a commercial that is creative, compelling and cost effective.